Non-stop action begins the minute they run out the door. 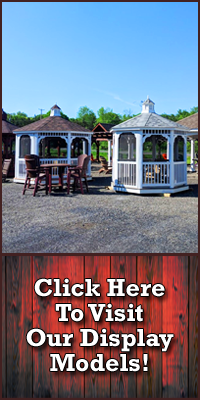 With covered lookouts and tons of ways to play, the Double Tower Series brings great style to the backyard - and double the fun for everyone! This series is ideal for multiple children of all ages with many exciting ways to let their imaginations soar. Climb up the flat step ladder with access railing or scurry up the 7' rock wall to one of two towers on the KTB-2 Turbo Tower. Navigate through rough waters with the ship's wheel or be on the look out with binoculars. Once you've come to shore, slide down the turbo tunnel slide to dig for buried treasures in the sandbox. The three position single beam offers two belt swings plus a baby swing to soar into the sky. The KTB-2 Turbo Tower offers lots of healthy fresh air options for your children. 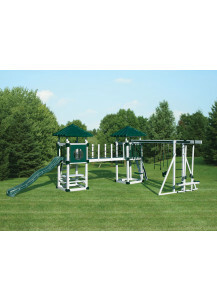 The A-7 Deluxe offers two 5' high towers connected by an 8' bridge. Climb up one of the flat step ladders, see a whole new world through the bubble panel and slide down the 10' wave slide. 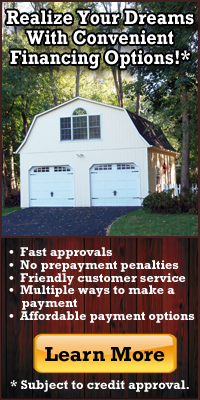 Once back on the ground, enjoy relaxing at the 4'x4' picnic table or sifting through sand in the sandbox. The 14' 4 position swing beam features monkey bars plus four of our superior swings, including a belt swing, trapeze, rubber infant swing, and the deluxe horse rider. The RL-10 Cliff Lookout offers lots of fun and excitement. 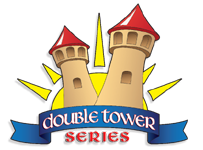 With three deck heights of 5', 7', and 9', as well as tons of ways to access the towers, your kids will have hours of fun. They can climb the jungle bars, scramble up the the 5' rock wall or run up the 12' access ramp. While atop the towers, they can use the steering wheel and keep an eye on things through the bubble panel, binoculars, or periscope. At the bottom of the 14' avalanche slide, they will find a 5'x5' clubhouse, tic-tac-toe board, 4'x5' picnic table as well as 2 belt swings and a trapeze. The RL-10 Cliff Lookout will keep them actively discovering the joys of the outdoors. 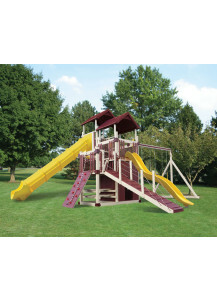 The enormous KRC Extreme play set is Swing Kingdom's largest play set. The KRC Extreme is big enough to take on the entire neighborhood at once. Three double towers, 3 slides, 2 rock walls, 2 cargo nets, flat step ladders with hand rails, jungle bars, a 12' ramp, a tower tunnel and a 12' bridge are just the beginning of what makes the KRC Extreme an amazing play set. 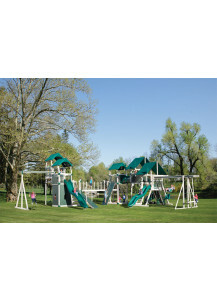 It also boasts a plastic glider, trapeze, 3 belt swings, a baby swing, horse rider, hammock swing, and a 3 rope tire swing. Adding to the fun are a sandbox area, a bubble panel, tic-tac-toe, ship's wheel, 2 binoculars, a steering wheel, telescope, periscope, 5'x5' clubhouse and a 4'x5' picnic table. The KRC Extreme is activity filled fun for kids of all ages.